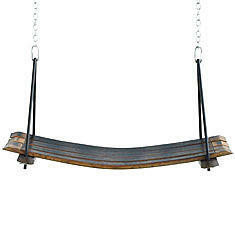 Made in Texas, this tree branch-or-patio pendulum seat's crafted using "retired" staves from oak barrels that once aged French or American vintages. Despite a heavy-duty carabiner'd 5ft chain to hang from, the weight limit's still 200lbs, so don't let Zambrano on there, lest he become the fat of the land. Just kidding. Seriously, quit punching.